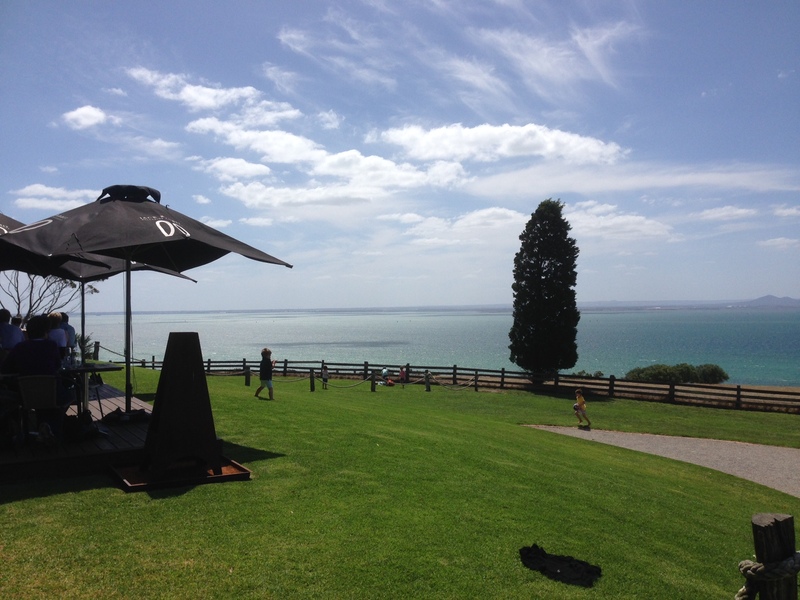 Yesterday my family and I took my sister and her husband on a winery tour on the Bellarine Peninsula, about 30mins from Geelong, Victoria’s second biggest city and the gateway to the popular Great Ocean Road.There are various wine regions in Victoria, the Bellarine Peninsula is known for its cool climate wines and can be found at restaurants around the world. The wineries on the Bellarine Peninsula are famous for spectacular views and the region for beautiful beaches and it produces plenty of boutique type labels also. Just for the record, I might have to enlist some help here, as truth be known, I was the designated driver and tour coordinator as I don’t drink wine. I might have the occasional sparking or rose but that is my extent of wine drinking. We picked up my sister and brother in law and headed down the coast about 10.30am. We arrived at Portalington at 12.15pm and headed straight to Jack Rabbit Vineyard for lunch and our first stop for wine tasting. I was surprised to find that the café was fully booked until 2pm! I had been visited Jack Rabbit a few months back with an Instameet group and found the views to the breathtaking and the meals great, the wines not bad either I’ve been told! 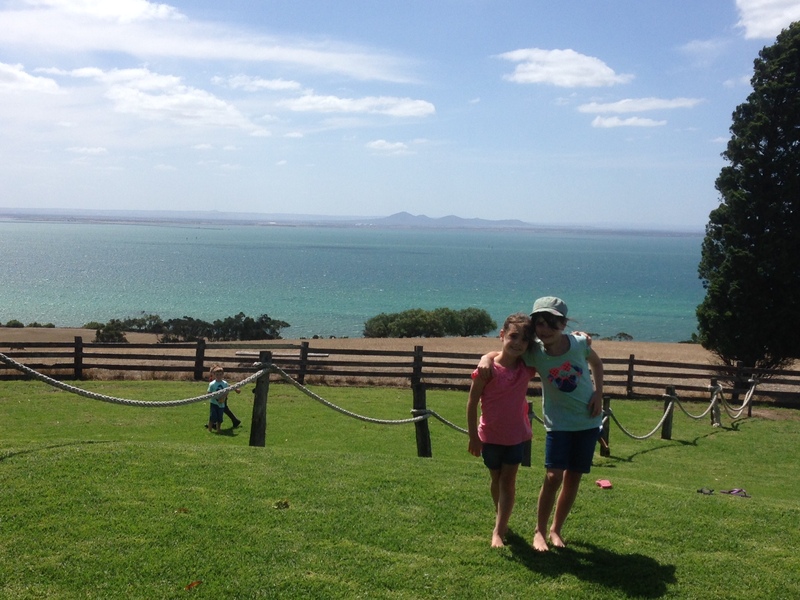 The girls one the lawn outside Jack Rabbit Café – such a beautiful view. This threw a spanner in the works for my little day out and not what I had planned but hey, I’m adaptable and will run with it. So I changed the program and we headed off for some wine tasting before lunch! 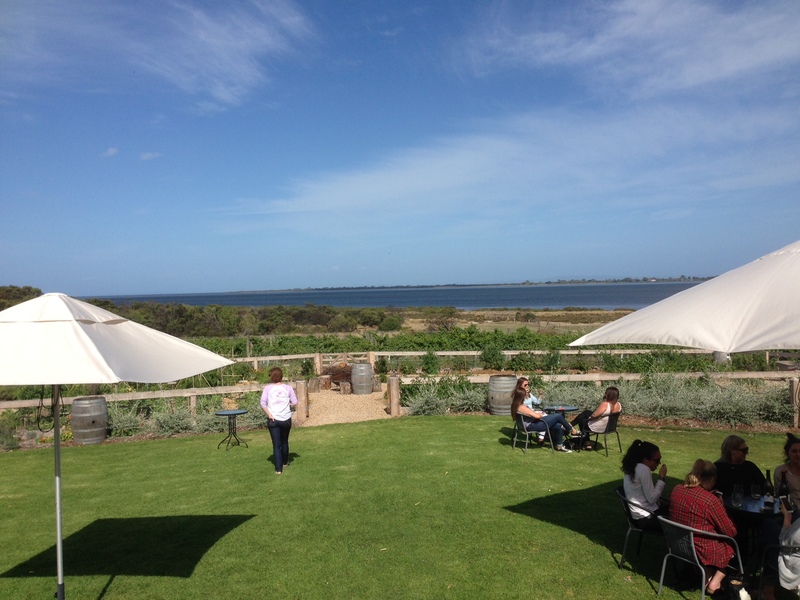 We headed down the road a bit and found Bellarine Estate which became our first stop to check out their offerings. Gavin, the sales manager was behind the bar and we found him to be great. He took the time to chat and explain the different wines and the history of the vineyard. We spent over an hour there chatting to him and discussing furniture made from wine barrels. We rewarded him with the purchase of a good amount of wine! Next stop Terindah Estate located directly across from Jack Rabbit Vineyard. Another breathtakingly beautiful winery with sloping views from the front windows right down to the crystal clear waters of Port Phillip Bay. It was particularly beautiful as it was a barmy 25 degrees with few clouds in the blue sky. The wines here were a little more expensive but again a few healthy purchases were made before leaving. The function room was set up for a wedding that evening and I must admit it looked pretty extravagant! Both my sister and I said, if we had our weddings over again we would do something like that. There was also a restaurant/café that takes in the amazing views while you eat. It was now close to 2pm so while the boys finished their wine tasting my sister and I headed back over to Jack Rabbit to see if we could snag a table. It looked pretty full as I walked up and when I opened the door my heart dropped to see that pretty much every table was still occupied. The waitress asked how many and when I said ‘7 thanks’, she replied ‘no, I could have done it 10 seconds ago but not now’. I was feeling a bit deflated at this stage when one of the other waiters walked past and overheard part of the conversation. He seemed to think it was ‘do-able’ and told me to wait a minute. The glimmer of hope I was holding on to was rewarded! Bingo! We got a table. I quickly ordered for the kids and some drinks while we decided what we would eat. The kids meals arrived promptly considering how busy they were. The kids inhaled their meals which was great, they must have been really hungry as it was very quiet when they were eating. After lunch they headed out on to the grass in front of the café to play with all the other kids. Shortly after our meals arrived and the rest of us got to eat ours in peace! All the kids playing on the beautiful lawn out the front of the café. My brother in law had a beef and bacon pie, my sister had a vegie frittata, I had a butterfly chicken breast and Craig had a seafood platter. All meals were fabulous and very reasonably priced. I could see the kids playing on the grass from our table so I could relax and enjoy my meal. The boys polished off a Jack Rabbit Rose over lunch. Its a very nice wine (even I drink that one) and we took a couple home with us. Back on the trail! Next up, Scotchmans Hill. Again, killer views and they had some bocce balls and a set of quoits out on the lawn to keep the kids entertained. This also meant that the boys could do their wine tasting with few interruptions. My sister and I sat out on the grass in the sun on chairs with some shade from the umbrella’s and watched the kids. The original house on the site is now the cellar door and there is also a restaurant if you were hungry. 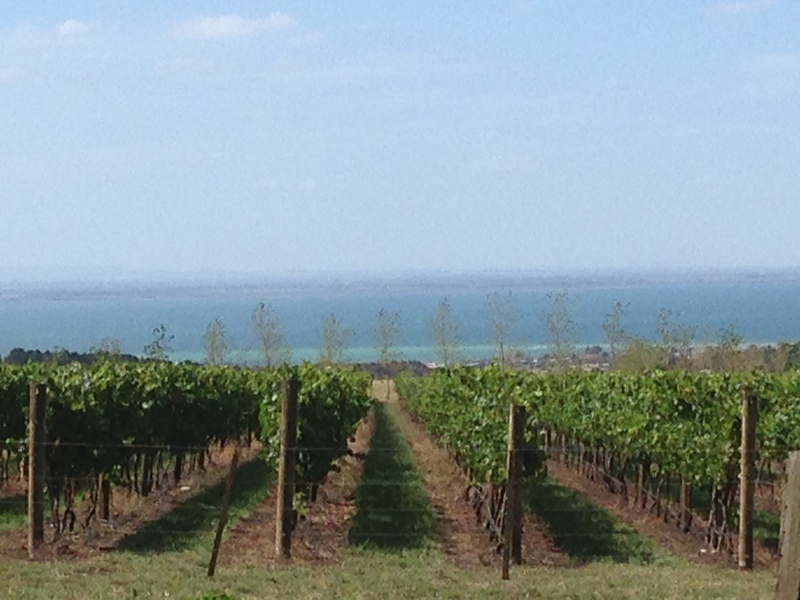 The vines at Stockmans Hill overlooking a prime view over Port Phillip Bay. It was kicking on for nearly 5pm now and we were running out of time. We headed towards Queenscliff as we had promised the kids an ice cream from the famous Scandinavian ice cream shop that my sister and I went to as kids. As we went through Swan Bay we stumbled across another winery, much smaller but thought we would give it a crack. Well we were not disappointed. Kiltynane Winery ended up being the favourite of the day. We arrived right on 5pm and the staff said if we were quick we could have a taste as they were only licensed until 5pm. 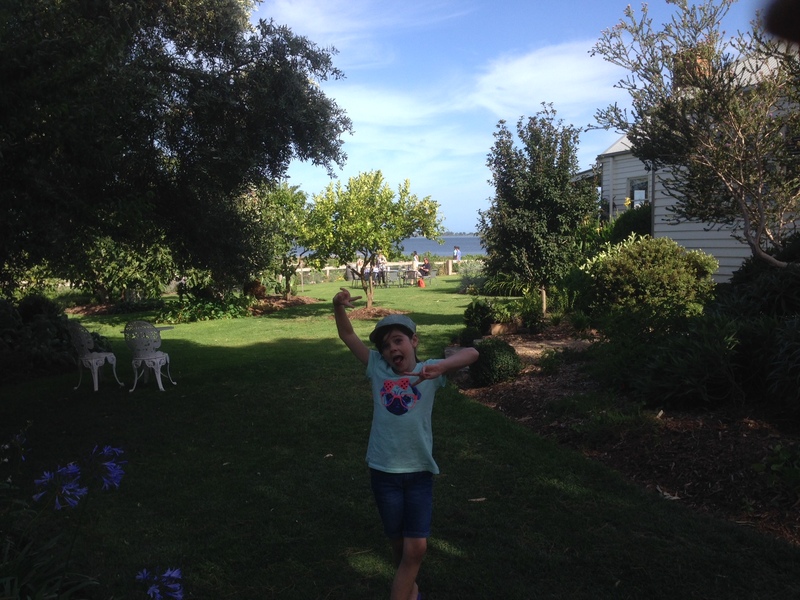 The house on the property has been turned into an art gallery and in front of the house is a lawn area with a large veggie garden at the bottom with (again) amazingly beautiful views across Swan Bay to Queenscliff. It had a really relaxed atmosphere and heaps of fruit trees around the garden. We were too late, but others were enjoying the wine with a delicious looking cheese platter, my mouth was watering! If I had it planned better we could have finished there with a cheese platter. It was one I will certainly be returning to for a whole afternoon. 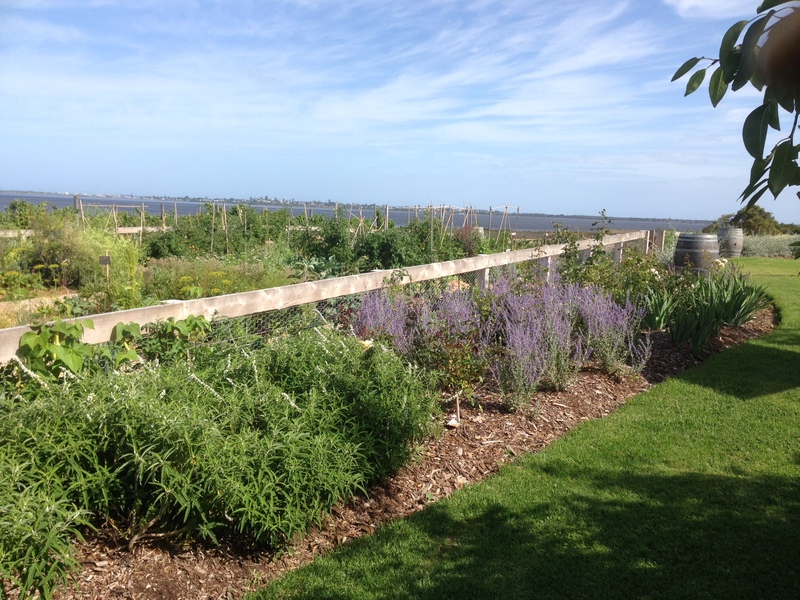 What really impressed me was the sandpit for the kids and they loved walking through the veggie garden and smelling the herbs, its the simple things in life that kids just love. Kiltynane Winery, awesome little spot looking at Swan Bay. Little gem of a find, we will be returning. We finished on a high note as we were all really impressed with Kiltynane and purchased a few reminders to take home! I love purchasing wine from the cellar door as I know its going straight back to the owners, supporting local produce. Its about the only place Craig and I purchase wine (apart from the Grange, one for each year the kids were born) and each time we pull out a bottle we relive the little story of where we bought it. A bit like most of our Christmas decorations that have come from holidays around the world! The kids enjoyed this place as well. Ice cream next, I think that’s what she is excited about! So we finished off with a scandi ice cream, I had salted caramel with waffle cone dipped in chocolate and dipped in sprinkles! Yes it was awesome! Caelan as per usual made a ridiculous amount of mess with it and dripped it on everyone sitting remotely near him – some things never change! 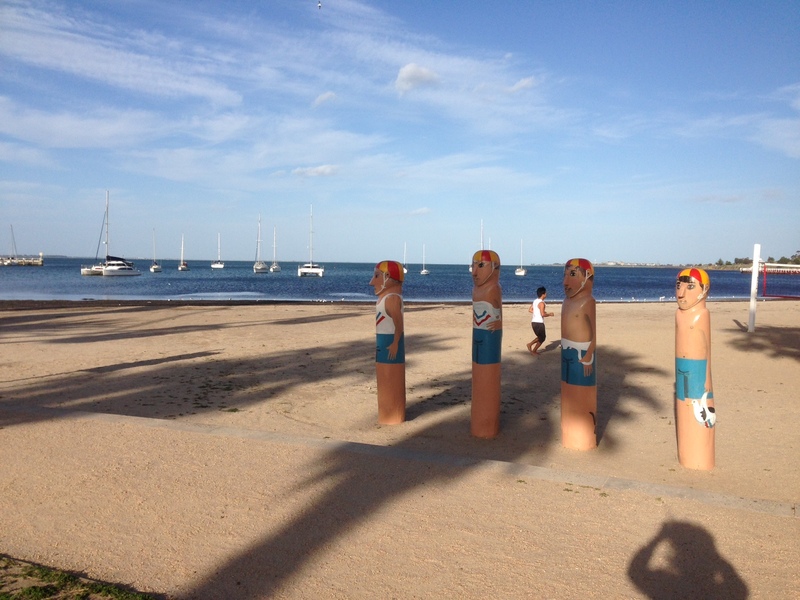 Time to head back to Melbourne, not without a little stop at Eastern Beach in Geelong for a ferris wheel ride and a couple of goes on the giant waterslide. This could be another post but briefly the kids had no togs so went down the water slide in their undies. Then jumped in the ocean for a quick swim. After they come out Keira and Caelan were screaming in pain, we believe it might have been sea lice or sand scratches from the slide! Sigh… tired and emotional time to go home and have some dinner. Fun day out, will be returning for an afternoon at Kiltynane very soon and Jack Rabbit is always a favourite of mine, great area of Victoria that holds great memories for my sister and I and we all had such a great day. Cant wait to do it all again. Bellarine Peninsula is a hop skip and a jump from the Great Ocean road so if you’re heading down that way make sure you read the following posts for further ideas – Cape Otway Lighthouse, Otway Fly Treetop Adventures and the world famous 12 Apostles. Happy travels, until next week when we head to Sydney for hot air ballooning and Australia Day festivities. Sure was, we had a lovely day. cant wait to do it again soon. There’s a few down there that I didn’t make it too so another visit is on the cards!